I have been a psychotherapist for over 25 years. I earned a Masters degree in Social Work from the University of Michigan and am a Board Certified Diplomate (BCD) in clinical social work. I am a Licensed Clinical Social Worker licensed by the Texas Department of Human Services. I have provided therapy to students at University of Houston's Counseling Center and am currently in private practice. I am on GuideDoc's list of the seven best marriage counselors in Houston. Does therapy have to be long-term? ABSOLUTELY NOT! Many clients report satisfaction after 2-6 sessions. Cognitive behavior therapy is used to treat depression, anxiety, phobias, and many other problems. It works to replace distorted thinking with realistic and balanced thoughts. This typically results in lowered anxiety as well as improvements in mood, interpersonal relations, and self esteem. I use cognitive behavioral therapy because it has been shown to be the most effective approach. Unlike other therapies such as psychoanalytic, psychodynamic, and integrative therapy, cognitive behavioral therapy can often be completed in a short time. Although I have seen a select few of my clients for years, I see many for only a few weeks. In couples counseling, I develop a written action-oriented, evidenced based plan with both of you detailing specific communication strategies to enhance and nurture one another, and goals of eliminating irritating, unproductive, deceptive, and hurtful behaviors. More information on cognitive behavioral therapy. Listen to me describe my approach to couples counseling. If your visits are not covered by insurance then I offer flexible fees ranging from $100 to $185 depending on income. Payments in the office can be made by cash or check. You may pay for an office visit in advance using Zelle, a user friendly secure and easy-to-use payment system. available from most banks. Use my email, help@micheleLane.com, as the recipient when using Zelle. Payment must be made the day before the session. If you are insured by Aetna, Magellan, or Humana I offer my lowest rate of $100. I do not accept any EAP insurance plans. If you are using insurance, you must fill out this form at least two days before the appointment. Make sure to find out from your insurance company what your co-payment is and whether you have met your applicable deductible. Please email me this information at least 24 hours in advance. If you are using insurance, you must fill out this form. Please fill out the client profile form at least one day before your appointment. Also download the couples counseling form but do not fill it out until preparing for your second session. Do not email me the form. What happens when couples come in for counseling? In the first session. all couples are counseled individually in separate 45 minute sessions not necessarily on the same day. This allows the partners to get a chance to discuss privately his or her history, symptoms, goals, and issues freely and openly, and without fear of retaliation, conflict, or emotional strife from the other partner. As a psychotherapist, I strive to understand comprehensively the ups, downs, special influences, losses, traumas, assets, vulnerabilities, and goals discussed in your life history. This facilitates my ability to mediate (when you meet together) and develop individualized, constructive interventions which will, help you both overcome painful obstacles and improve your relationship. The next week couples are again counseled individually, this time for separate 30 minute sessions followed immediately by a 30 minute session in which you are counseled together. Therefore, the total counseling time for this second appointment is 90 minutes. Remember to bring your filled out couples counseling form. Do not show your completed forms to one another. 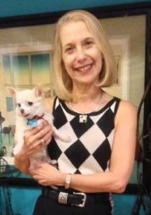 Following this second meeting, I will develop the written action-oriented, evidenced based plan with both of you detailing specific communication strategies to enhance and nurture one another, and goals of eliminating irritating, unproductive, deceptive, and hurtful behaviors. .
Research has shown phone counseling to be effective. The method that I use, cognitive-behavioral therapy, has been found to work better with phone therapy than therapy that focuses on discussions of feelings (Mohr et al., 2005). You can stay in the comfort of your home of office. It provides the privacy of the telephone, avoiding eye contact etc. When you first call we will discuss the best time for the appointment, goals for therapy, and the fee. Payment for phone therapy can be made with Zelle or with PayPal. 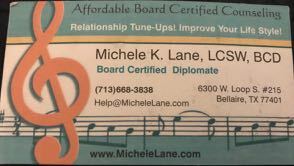 Use my email, help@micheleLane.com, as the recipient. West Loop South near Bissonnet about 8 miles from downtown Houston, 2.4 miles from the Galleria, and 4.5 miles from the Texas Medical Center. See my daughter Lauren's Personal Training Site if you are interested in maintaining body fitness.